Workshops with Peter Eastway and Friends: South Georgia/Antarctica Odyssey with Peter Eastway, 14 March to 3 April 2020 - Only 1 cabin left! South Georgia/Antarctica Odyssey with Peter Eastway, 14 March to 3 April 2020 - Only 1 cabin left! 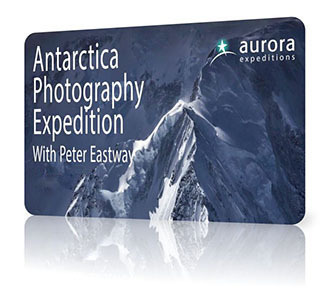 Join Peter Eastway on his second of two trips to Antarctica for 2020. Travelling to Antarctica is the trip of a lifetime. For photographers, it is even more special with the opportunity to capture some of the most incredible and memorable locations and wildlife anywhere on Earth. Imagine coming home with a camera full of amazing landscape and wildlife photographs and videos! This is a trip like no other. And to help you get the most out of your voyage and your photography, Peter Eastway has been invited again by Aurora Expeditions to lead groups of photographers on two voyages to Antarctica: a fly-in visit to the amazing Antarctic Peninsula, or a South Georgia & Antarctica Odyssey expedition, both on the brand new Greg Mortimer, a purpose-built expedition ship. There are three ways Peter will assist voyagers who join his photography program. • He will give a series of more formal presentations on photography. Berth prices are from US$17,700 per person.